While many expect Rangers center Kevin Hayes to be dealt between now and the trade deadline, Larry Brooks of the New York Post believes that they would be better off re-signing him unless they can get a young core winger or defenseman back. While adding more depth to their prospect pool is still beneficial, he argues that they’d be better off re-signing him over acquiring a pick or prospect that could reach Hayes’ current level several years down the road. The question is how much is it going to take to get the 26-year-old to sign long-term? Brooks suggests a six-year, $6MM deal could be a fair amount as it would represent a small raise on his current $5.25MM deal while beating what Adam Henrique got on his extension with Anaheim this past summer. The Rangers aren’t eligible to officially re-sign Hayes until January 1st and GM Jeff Gorton acknowledged that there haven’t even been preliminary talks on an extension just yet. Still with the Rangers, although they held Mats Zuccarello out of the lineup tonight once again due to groin issues, head coach David Quinn told reporters, including Newsday’s Colin Stephenson, that the winger remains day-to-day. Zuccarello has now missed eight of the last ten games with this problem and the team has acknowledged that his recovery has not gone as well as anticipated. The 31-year-old is one of New York’s more notable potential trade chips this season but teams that may be interested are going to need to see that this won’t be a lingering problem before trying to make a move. Capitals center Evgeny Kuznetsov skated Monday for the first time since suffering a concussion nearly two weeks ago, notes Isabelle Khurshudyan of the Washington Post. He missed his sixth straight game tonight but his return appears to be closer than winger T.J. Oshie, who is dealing with a concussion of his own. He has yet to skate since sustaining it and head coach Todd Reirden indicated that he’s unsure if Oshie will be able to skate at all this week. Considering that this is his fifth career concussion, Washington will certainly be erring on the side of caution. The Washington Capitals can’t be happier with one of their top players in Evgeny Kuznetsov, who took that next step last year when the won the Stanley Cup, putting up career highs in goals scored and points with 27 goals and 83 points. However, general manager Brian MacLellan feels that he can do even more this year — help out on the penalty kill, according to the Washington Post’s Isabelle Khurshudyan. That’s not a role that Kuznetsov has played much of over the course of his career. The 26-year-old has played a grand total of just 11 minutes over the last four years, which averages out to two seconds per game. However, while new head coach Todd Reirden probably won’t make too many changes to the team’s lineup after last year’s success, he has made it clear that he wants to make changes to their penalty kill, which was 15th in the league last year at 80.8 percent. One way to do that would be to inject more speed into it. That’s where Kuznetsov comes in, who could add a new element to their shorthanded line and perhaps improve his own defensive play at the same time. The Capitals are without recent signee Sergei Shumakov so far in training camp, according to NHL.com’s Tom Gulitti. The 26-year-old winger who has spent his entire career in the KHL, signed a one-year, entry-level contract worth $925K. Shumakov posted 17 goals and a career-high 40 points last year for CSKA Moscow. He is expected to arrive from Russia today. Josh Yohe of The Athletic (subscription required) analyzes the play of Pittsburgh Penguins defenseman Brian Dumoulin, who had a breakout season for Pittsburgh and who was arguably the team’s best player in their five-game series against the Washington Capitals in the playoffs last year. Domoulin, who partners with oft-injured Kris Letang, seemed to take off last year. Always a top defender, he even has started to show a little offense as he scored five goals. That may not sound like much, but considering his career-high had previously been one goal, that’s a big improvement. The team hopes he continues to get more involved in the offense this season. In the same article, Yohe reports that head coach Mike Sullivan will miss a few days after the death of his father, George Sullivan. Assistant coach Jacques Martin will take over for Sullivan until he returns. Sam Donnellon of Philly.com examines Philadelphia Flyers goaltender Anthony Stolarz, who just two years ago was looked at as a big part of the Flyers future. Fast forward to today and Stolarz is the fifth wheel in a goaltending system that already has too many goaltenders. Assuming things go as expected, the Flyers will be keeping Brian Elliott and Michal Neuvirth on their big-league club and will send Alex Lyon and top prospect Carter Hart to the AHL’s Lehigh Valley Phantoms. That leaves Stolarz, who missed most of last year after undergoing a second knee surgery. Donnellon writes while injuries are an issue amongst the veteran goalies, the likelihood that Lehigh Valley will institute a three-goalie system is unlikely, especially considering that the team needs to further develop Hart, their goalie of the future. The Conn Smythe Trophy, awarded to the MVP of the postseason, could have gone to several players on the Washington Capitals based on performance alone. Yet it really could not have gone to anyone but captain Alex Ovechkin. Yes, he led the postseason in goals and set a franchise record in playoff goals as well, but really this is indicative of the role that Ovechkin played as the locker room leader for the Capitals and the best player in franchise history. En route to the team’s first ever Stanley Cup championship, Ovechkin scored 15 goals and totaled 26 points, the second most on the team to Evgeny Kuznetsov. He logged major ice time, played a physical game, and overloaded opposing goaltenders with shots. 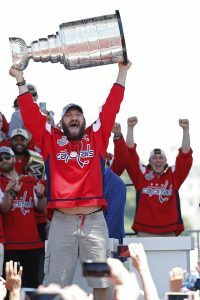 Ovechkin did everything right, on and off the ice, to finally get the Caps over the hump and to the Cup. This Conn Smythe is also very much a career achievement award. Ovechkin is a career-Capital, the first overall pick in 2004 and the long-time captain. He is not only the face of the franchise, but one of the best players in the NHL since the turn of the century. He is a surefire Hall of Famer eventually, but undoubtedly has already earned the title of the best player in Washington history. Ovechkin is the franchise leader in goals and points, single season and career, and games played. He is a three-time Hart Trophy winner, a seven-time Maurice Richard Trophy winner, an Art Ross Trophy winner, Calder Trophy winner, and seven-time All-Star; but he now has the ultimate prize, a Stanley Cup, and that is what he needed to go down as one of the best. A well-deserved Conn Smythe win for Ovechkin. Vegas Golden Knights head coach Gerard Gallant showed why he is considered to be a players’ coach when he was asked Sunday about the performance of 22-year-old Shea Theodore, according to the Associated Press’ Stephen Whyno. The young blueliner has struggled mightily in the Stanley Cup Finals, having been on the ice for four of the team’s past six goals. In Game 3 alone, he made a questionable decision that created an odd-man rush on Evgeny Kuznetsov’s goal and then followed that up with a bad turnover that allowed Devante Smith-Pelly to score the goal that sealed the win. Regardless, despite forcing the youngster to skip one shift, the veteran coach defended his player. Theodore is expected to continue playing next to Deryk Engelland in Game 4. Whyno said that Engelland reassured Theodore and told him to simplify his game. Gallant also said the team might make some lineup changes for Game 4 on Monday. There is lots of speculation the team may bring back wingers William Carrier and Tomas Tatar, who both have played sporadically throughout the playoffs for Vegas. There is also talk the team might shuffle some of their middle lines. The team’s second line of Erik Haula, James Neal and David Perron has struggled in the Stanley Cup Finals. In three games, they have gone for a combined one goal, two assists, 10 shots on goal, 14 shots missed or blocked and a minus-9 rating. NHL Network’s Brian Lawton reports that the team could promote Alex Tuch to the second line in order to change things up. Despite rumors that he suffered a concussion on a reverse hit from Neal, Washington Capitals defenseman Brooks Orpik had the wind knocked out of him, according to Whyno. The veteran defenseman said a concussion was never the issue as he couldn’t breathe initially after the hit. He is expected to be ready for Monday’s Game 4. Orpik was never checked for a concussion and the Washington Post’s Adam Kilgore writes that the NHL failed once again to show the world that they are on top of handling concussions as Orpik was allowed to return immediately on the next shift. Two key contributors for the Capitals in Game 3 were Smith-Pelly, who scored the insurance goal, and Jay Beagle who assisted on two goals as well as had a 61 percent face-off success rate was another key factor for the Capitals. Both will be unrestricted free agents and with the Capitals spending much of their time focused on John Carlson’s upcoming free agency and their lack of salary cap space, one has to wonder whether both Smith-Pelly and Beagle’s strong play might force the team to allow them to leave this offseason. 6:42: Kuznetsov is on the ice for the Capitals during warmups. Whyno reports that general manager Brian MacLellan said that if he gets through warm-ups, he’ll be in. He’s still a game-time decision. 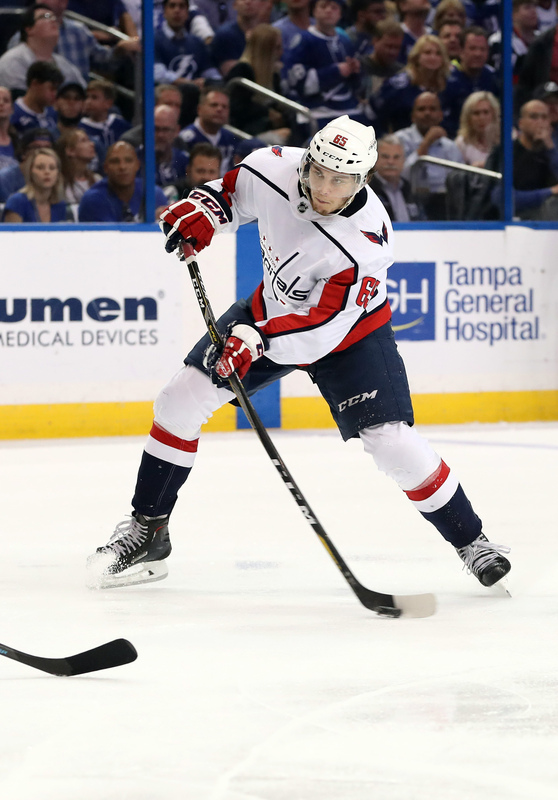 4:37: It looks like Evgeny Kuznetsov will be considered a game-time decision tonight for Game 3 between the Washington Capitals and the Vegas Golden Knights at Capital One Arena, but speculation of whether the Washington Capitals leading scorer will play continues. With 25 points in this postseason, the star center has more points than any player in this year’s postseason, but after suffering an apparent wrist injury to his left arm that forced him to leave Game 2 early after a hit from defenseman Brayden McNabb, his status has been up in the air. However, Kuznetsov participated in an optional skate with the team Friday and then again today for the team’s morning skate, which allowed the Associated Press’ Stephen Whyno to speculate that all signs point to a Kuznetsov return tonight, pointing out that the fact that he participated in line rushes alongside Alex Ovechkin and Tom Wilson and did not have any visible arm brace. However, Sportsnet’s Chris Johnston adds that while it might look like Kuznetsov is expected to play, don’t assume that. The possibility of subterfuge is a legitimate possibility with the hopes of throwing off the Golden Knights’ game plan for Game 3. Johnston points to Kuznetsov’s offbeat humor when asked if he could help give Washington the advantage for Game 3. Johnston also points out that while Kuznetsov did participate in all drills, he didn’t look comfortable out there, pointing out that he gritted his teeth when taking shots, which is not standard for the team’s points leader. Unfortunately, we’ll have to wait until right before the start of Game 3 to find out if he’ll be out there.